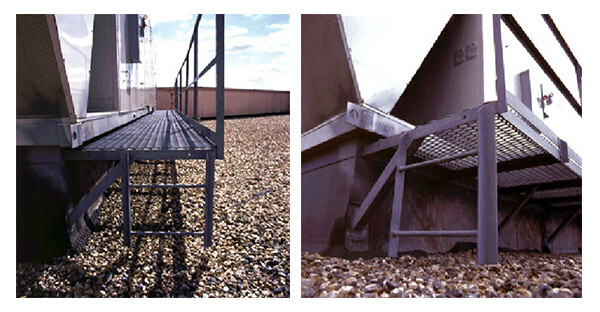 Service, repair and maintenance access to large rooftop equipment can be a challenge especially when ladders can often puncture or damage the roof deck. Conn-Fab catwalks and work platforms are cantilevered from the curb itself, which means that no part of the catwalk or its suspended ladder comes in contact with the roof surface.They are a generous 36” wide and clear the roof by at least 2”. This practical and cost-effective solution comes with removable hand rails and is shipped in 10’ sections. Installation is quick, structurally sound and meets OSHA specifications.